Worried about people snooping around your USB drive? Digital encryption not good enough for you? What you need is a USB Cryptex to secure the drive from even being accessed! Made completely out of copper and brass, [Scots72] really put a lot of effort into this beautiful piece of metalworking. The USB drive itself is encased in epoxy inside of a copper tube — the rest is built around it. Built almost entirely using hand tools, and we can only imagine how long the process took to complete. But patience is often rewarded with results like these! The Vintage Computer Festival last weekend featured racks and racks of old minicomputers, enough terminals for an entire lab, and enough ancient storage devices to save a YouTube video. These storage devices – hard disks, tape readers, and 8″ disk drives – were only connected to vintage hardware, with one exception: a DEC RL02 drive connected to a modern laptop via USB. The DEC RL02 drive is the closest you’re going to get to a modern mechanical hard drive with these old machines. It’s a huge rack unit with removable platters that can hold 10 Megabytes of storage. [Chris] found one of these old drives and because he wanted to get into FPGA development, decided to create a USB adapter for this huge, old drive. The hardware isn’t too terribly complex, with a microcontroller and an FPGA that exposes the contents of the drive over USB mass storage. For anyone trying to bootstrap a PDP-11 or -8 system, [Chris] could download disk images from the Internet, write them to the disk, and load up the contents of the drive from the minicomputer. Now, he’s using it with SimH to have a physical drive for an emulated system, but the controller really doesn’t care about what format the disk pack is in. If [Chris] formatted a disk pack with a FAT file system, he would have the world’s largest and heaviest USB thumb drive in the world. USB sticks are very handy. They are a very portable and relatively inexpensive means of storing data. Possibly the most annoying part about using one of these devices is when you inevitable leave it behind somewhere by accident. This is especially true if it contains sensitive information. [Eurekaguy] feels your pain, and he’s developed a solution to the problem. [Eurekaguy] designed a custom cap for USB sticks that beeps approximately every minute after the USB stick has been plugged in for five minutes. The cap is 3D printed and then slightly modified with four 1mm holes. Two wires are routed between these holes to make contact points for the VCC and GND pins of the USB stick. The beep circuit is comprised of a tiny PIC12F629 microcontroller along with a couple of other supporting components. The circuit is wired together dead bug style to conserve space. Three AG5 batteries power the circuit. A small piezo speaker provides the repeating beep to remind you to grab your USB stick before you walk away from the computer. We’ve actually got a few dead hard drives collecting dust so when we hear about a project that finds a use for one we perk up a bit. But we were somewhat disappointed when we discovered this was a smartphone stand, pen holder, and LED lamp in one. We just don’t have a use for this kind of triple-tasker. But wait… the dead drive has a secret. It still serves as data storage, if you know how to enabling the drive within. As you can seen, [Samimiy] removed all the guts of the HDD, repurposing the platters and mounting brackets as the phone holder, and mounting plate for a couple handfuls of LEDs. The lamp portion can be adjusted thanks to the articulated based from a small desk lamp he had in his parts bin. The device receives power from the USB connector you can see in the upper right. That’s where the first part of the secret comes in. This isn’t just supplying power, it provides a USB connection to the thumb drive hidden inside the HDD case. But just connecting it to your computer won’t mount it. [Samimy] took the light sensor from an automatic nightlight and set it up below the pen holder. If you shine a flashlight down the hole in that piece of wood it will routed power to the secret USB drive causing it to enumerate on your system. Pretty clever! Take a look at his build video after the break. We wonder if there’s a way to incorporate this light-based lock system into that mouse-mounted thumb drive. Over 150 projects made from scrap parts (translated) have been posted for your viewing pleasure. They make up the entries in the “Make fast the scrap” project from c’t magazine. We already looked in on a toilet paper printer, but there’s a ton of other fun stuff to look at as well. Every time you load the link at the top, the page picks a different set of entries to display. You can click through all the pages, or reload to play a little project roulette. The image above shows three that caught our eye. To the upper right is a lighbulb-man riding an old computer mouse reverse-cowgirl style. Quirky, but anyone who has access to an electroplating setup can get away with making simple objects like this into awesome desktop sculptures. 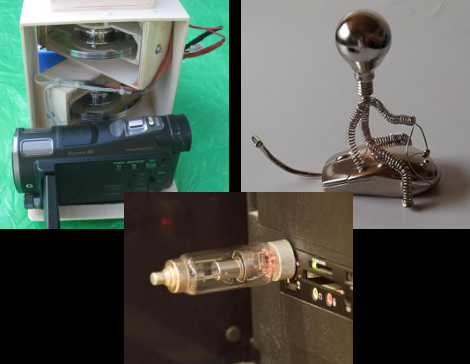 Moving clockwise we have a tiny USB drive mated with an old vacuum tube. The machine translation is a bit rough, but it looks like the LED from the thumb drive gives the tube a bit of a red glow. We just think it’s interesting to carry around a vacuum tube with you. The final banner image shows a gyroscope for a camcorder. 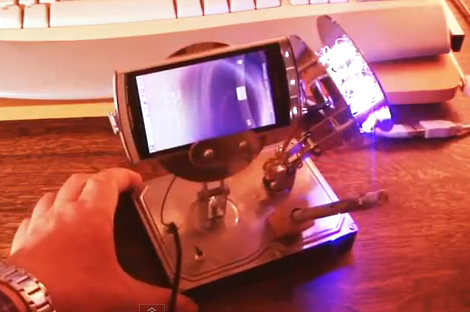 This is an awesome setup, which you can see in action after the break. A pair of broken hard drives provide motion stabilization for a camera. The entire assembly has a handle on the top with a universal joint. When the drives are spinning, the platform holds very still, even if the operator is swinging the unit around wildly.